Heavy damage caused to Carmia Reserve by incendiary kites launched from Gaza. MK Chaim Yellin to cabinet: 'A kite is like a Qassam'. 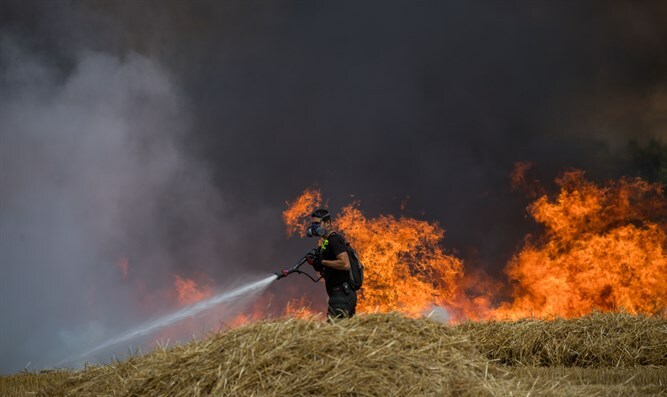 Incendiary kites launched by Gaza Arabs Saturday caused a huge fire at the Carmia Reserve in the Hof Ashkelon Regional Council. The fire raged for several hours and destroyed 75 acres (300 dunam) of the reserve's total of 250 acres (1,000 dunam). Twelve firefighter teams and four fire aircraft extinguished the fire. Over the weekend, fires broke out in more than 40 locations in the Gaza vicinity. At this hour, firefighting forces are working to extinguish fires raging near kibbutzim Or Haner, Nir Am, and Be'eri. Former Defense Minister Amir Peretz (Zionist Union) said "the kites from Gaza are not to be taken lightly. Even when the damage is to property, it is the livelihood of many farmers who have struggled all these years not to succumb to fear and risk and continue to cultivate their lands. "First, the property tax authorities must act quickly and pay compensation for all damages incurred. The government must invest all means to find a technological solution to this threat, and send a message to Hamas that it will pay a heavy price if it doesn't prevent this expanding phenomenon," Peretz added. Gaza area resident MK Chaim Yellin (Yesh Atid) tweeted video of fires raging in agricultural areas: "A kite is like a Qassam," wrote Yellin, and sent a message to cabinet ministers: "You set the formula. Quiet will be met with quiet. But kite terror? Entire fields are burned, damaging agriculture, nature, and animals that are totally not part of this conflict."